The alternator is vulnerable to high levels of heat and stress, which makes it all the more important that you replace your failed alternator with one that you can trust. 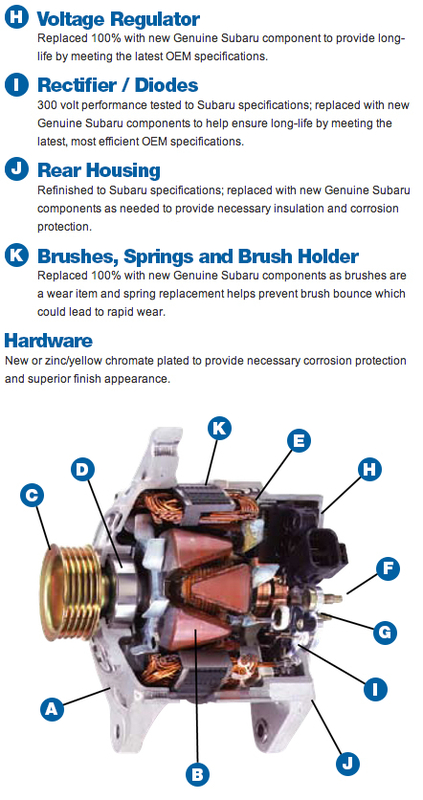 Unlike remanufactured aftermarket parts, Subaru re-manufactures their alternators by completely disassembling the old alternator, replacing or repairing any internal components that do not meet the strict Subaru OEM standards, cleaning any dust that has gathered inside the alternator, and testing the output and load capacity of the alternator after final reassembly. This process makes genuine Subaru remanufactured alternators perform as well as new Subaru alternators but keeps the cost down for you--choose a genuine Subaru remanufactured alternator now at Subaru Superstore. 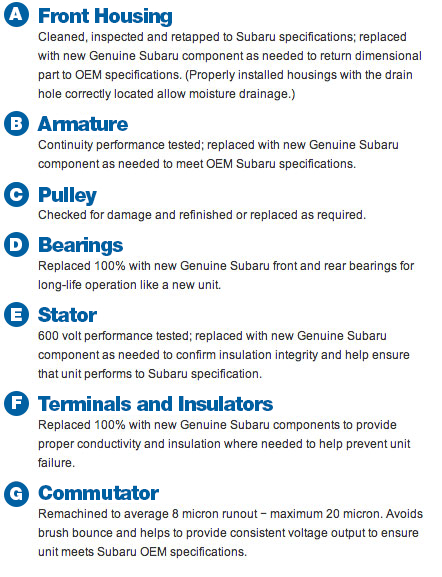 When your Subaru needs parts and components to be replaced, don't settle for just any aftermarket part. Choose the parts you can trust with the genuine Subaru parts and genuine Subaru remanufactured parts featured in Chandler at Subaru Superstore. Not only do we have the OEM Subaru parts you can trust to keep your vehicle on the road, you can take advantage of installation performed by factory trained Subaru technicians. If you're looking for savings, look no further than our Subaru service specials and our offers on Subaru parts and accessories. We're proud to be your premier Arizona Subaru service center as well as Arizona's #1 volume dealer, thanks to our value priced new Subaru models, excellent finance and lease incentives, extensive certified pre-owned Subaru selection, and committed staff. For more information about our remanufactured Subaru parts, give us a call at (888) 264-4068 and come by and see us at 1050 S. Gilbert Road, Chandler, AZ 85286--we're just a short trip from Scottsdale or Gilbert, Arizona.